I’m afraid that I sometimes forget to say it, but I want you all to know that I do appreciate all your visits, and especially your comments both on my blog, and the linkes and comments on Facebook. 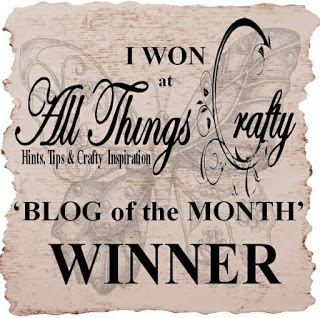 Janette Padley, the designer at Dragons Lair Designs, has started a weekly “Sunday Showcase” over on the Dragons Lair Designs Inspiration Blog a few weeks ago. 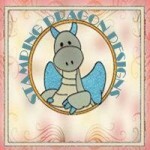 It is a chance for everybody to link up anything they’ve made using Dragons Lair Designs items. Usually it’s just Design Team members who’s work is seen regularly on the blog, but by linking up their creations anybody can be a part of the Sunday Showcase – and even better, at the end of the week, somebody get’s randomly chosen to receive an item from the DLD store, so even more reason to come and show us your DLD makes. 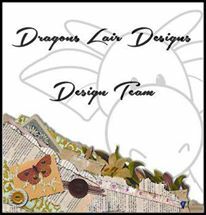 It’s also a chance to get a DLD FREEBIE – because Janette is putting in a link to a Dragons Lair Designs freebie in each Sunday Showcase post. And of course these could be used to join in the showcase linkup if you don’t already have something DLD in your digital library. Today I’ve got a quick digital scrapbook layout to show you – in fact it’s a double layout. 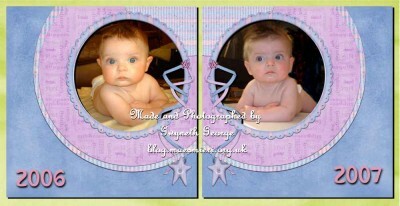 I hunted out photos of my youngest nephews when they were about the same age for this one. Background from “Think Spring” mini kit – Freebie with Sunday Showcase on Dragons Lair Designs Inspiration Blog post of 20th March. This is a super quick digital layout because I used a “Quick Page” design so didn’t have to worry about placing the background, frame, ribbon, etc. I also took The green background from the previous freebie and the quick page from yesterday’s freebie into the My Craft Studio Software. I made a 2nd copy of the quick page and then flipped it. With my working area at A4 landscape I put the background behind and resized the quick page so that they fitted on side by side across the middle. I then hunted out and re-sized the two baby photos. I then placed them behind the quick page, saved, and finaly cropped and watermarked in IrfanView.